Have you heard of Posterous yet? It’s a free hosted blogging service, where the aim is to making the act of posting content as simple as possible. Which means that posting-by-email is the primary interface. Send Posterous anything in a mail message – text, pictures, video, other files – and it tries to do The Right Thing with whatever it is, to make it work as a post. And on the whole it works very well. I’ve been playing around with it recently and I’m impressed. I like the simplicity and the immediacy of it. That might explain why I was excited to see today’s announcement of a Posterous iPhone app. PicPosterous (iTunes Store link) claims to be “a replacement for the Camera app on your phone”, and while I wouldn’t quite go that far, it is a nifty way of getting photos from the phone to the web as fast as possible. 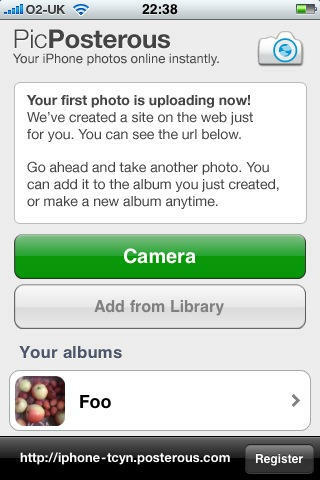 By default, the app uploads your pics to a fresh Posterous site, which you can “claim” later when you’re ready to sign up, or if you already have a Posterous account. So, without telling the app about my existing account, I took a photo and it was promptly uploaded to a new site. After telling the app who I was, my stuff was automatically moved to my existing Posterous site. Very neat. Look through the comments on the announcement and you’ll see some confusion from users about adding text captions. The “album” name you’re asked for is actually the post title. Looks like this will be fixed in an update soon.